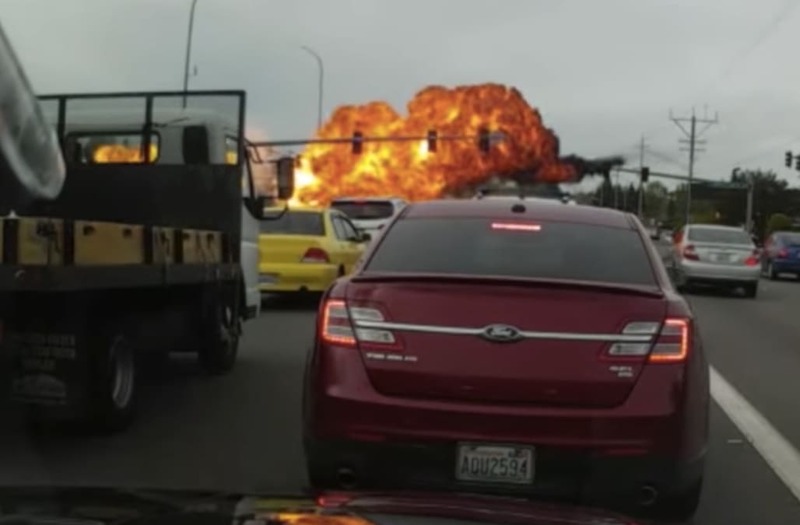 A driver's dashcam captured remarkable footage of a small plane crashing into a busy street in Washington on Tuesday. In the clip, the plane was seen clipping power lines as it plummeted to the ground. A huge fire ball can be seen erupting in the graphic footage, but the Seattle Times reports the two people inside the aircraft walked away with no injuries. The single plane crashed after departing from a nearby local airport in Mukilteo, which is about a half our north of Seattle. Police say several vehicles were damaged in the wreckage and subsequent fire, with at least one vehicle burned in the images the department posted online. One of the witnesses, Amanda Hayes, told KOMO that her car had been grazed by the wing of the small plane before the crash. "I'm so lucky," Hayes said. "I just said, 'Get down!' And before I know it, I could feel the heat on my face... and like the fireball and the wing clipped at the end." Police blocked traffic on the Mukilteo Speedway and the town's public transit authority has rerouted bus throughout the local area. The crash also reportedly caused a brief, widespread power outage in the area, according to the Snohomish County Public Utilities District.